The yearbook staff and their reps show off their cookie cake reward before celebrating. 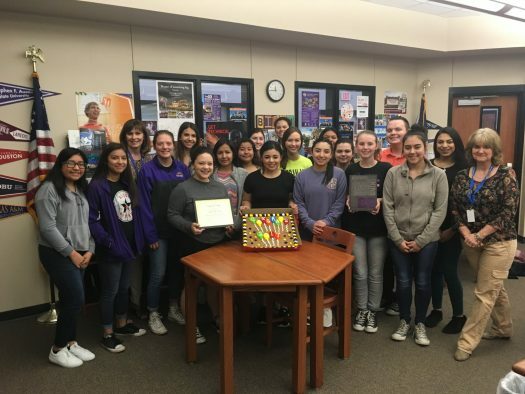 The journalism staff enjoyed a cookie cake to celebrate winning third place in Lifetouch’s National Best of the Best competition, competing against all the yearbooks produced by Lifetouch nationwide in the small schools division. The staff regularly wins awards in the Lifetouch contest; several years ago they won first place, but since then it has mostly been honorable mentions; the move up in rankings indicates a stronger book. The cookie cake celebration with their yearbook reps has become an annual tradition since the team wins every year. Yearbook representatives Kim Weaver and Neashia Simpson traveled from Tyler to celebrate with the staff. They brought the cookie cake, and adviser Melonie Menefee bought pizza for everyone.